Chandeliers seem to be everywhere today - cards, clothing, and on ceilings (obviously). Even though they seem trendy, chandeliers are classic and I enjoy discovering modern takes on them. Plus, I love lighting...I can spend hours looking up at the lights in hardware stores. You know you do it too. 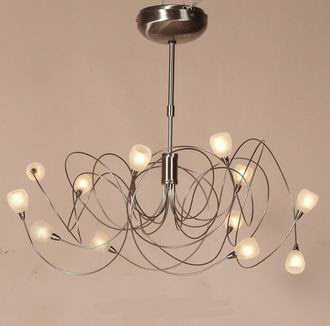 Bethel International has an interesting selection of lights from chandeliers to contemporary lighting. I'm smitten with the red one above. Modern versions of the chandelier? A red chandelier would be really striking! There's a designer doing these awesome 3-D heavy paper replications of chandeliers. I'm describing them poorly, but they were so unique, and now I can't find a link on the web. What is it about chandeliers that is so alluring? PS. Thanks for stopping by my blog! zakstar - oh love that one too! I think I may have seen the chandeliers you are describing. Very cool. 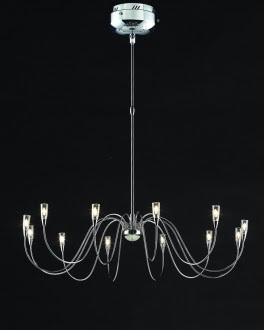 I love chandeliers, they may be everywhere..but I never tire of them :) Have you seen the antler chandeliers???? Uniquely gorgeous! Teal - oh I know - those are great too! i love chandeliers. the store i used to work at had a minimalist theme going on. white box room with white chandeliers and black armchairs. 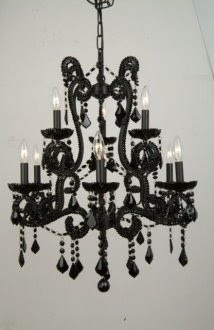 to be honest, i have such a thing for black chandeliers i can't wait to buy some! 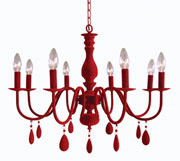 I love the red one, it'd be so pretty in my dinette! I love pops of red, they always make me smile.